Businessbarcode.com is trusted destination for Card Maker Software to design business, ID card generate birthday, greeting, cards and labels. Now get smart looking and business friendly labels, tags designed and prepared on your PC in simple and easy way. Software design customized ID cards (ID badges) and labels in different shape suitable for common business needs. Technically advanced Card and label maker program provides solution to design quality labels (with all essential features) without any extra efforts or technical assistance in few mouse clicks. Business Card Maker Software provides easy way by aid of which you can design your own style of cards as per requirement. Business cards, staff cards, membership cards etc customized with texts, color, different fonts etc can be created in the simple and convenient way. With the latest technology features, it is now possible for you to make your own company ID card within just a few steps instead of taking help from any IT professionals to do it. Just get the easy to operate ID card maker software and make your own ID card to suit your preferences at an affordable price. ID Cards Maker (Corporate Edition) design id cards in various shapes including rectangle, rounded rectangle, and ellipse. Software has various image designing objects, pre-defined templates (pre-loaded ID card design) for creating all types of id cards. Program also has specialist mode to design visitors ID cards. Student ID Cards Maker Software design and print identity cards for group of students. Program offers Live Group and Batch Processing Mode for ID card designing of multiple students using Excel Data. You can crop images for ID cards using Image Cropping Tool. Gate Pass ID Cards Maker Software design visitors id cards as well as Gate Pass for visitors. Program provides camera settings option to capture the photo of visitor. Software has option to add the visitor details to the database while designing visitor id card. This day comes only once a year. Make this day memorable forever by crafting your own birthday cards to gift to your loved one by using Birthday Cards Designing Software. Software will assist you to create the attractive birthday card of your choice to let your friend or family know how much you care for them. Spread your Christmas greetings or holiday greetings now in a customized look. 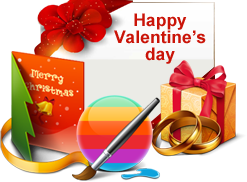 Just add a photo you like, texts or expressive messages and completely change the way you had been greeting your friends and near ones till now by using latest technology greeting cards maker software. Created customized greeting cards can easily be printed and gifted to friends and families with wide range of printing options. Wedding card maker software helps you to make printable designer wedding invitation cards for your marriage occasion. Design attractive wedding invitation and send them to your friends, relatives and other people, with this wedding card designing program. Wedding card designer program allows you to add Backgrounds, Styles and Shapes on the card to make creative wedding cards. Logo designer software makes business logo, icons and commercial images for your company. Logo designing program creates professional logo for small to large business enterprises. Logo maker program provides inbuilt various types of templates to design corporate logo, business icons or banners for your organization.